Seventy-three million sharks die for this — every year. 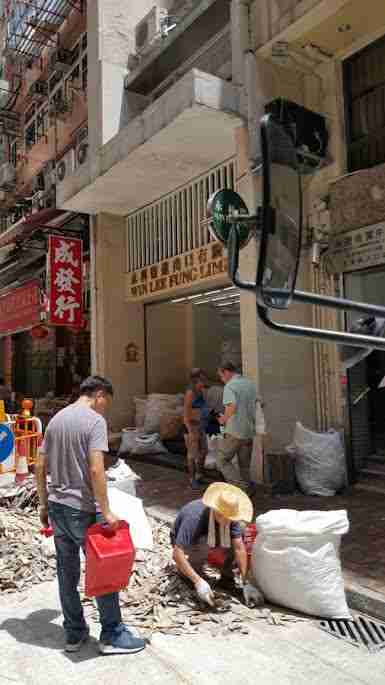 Mike Staley was walking to his office in Hong Kong when something stopped him in his tracks. 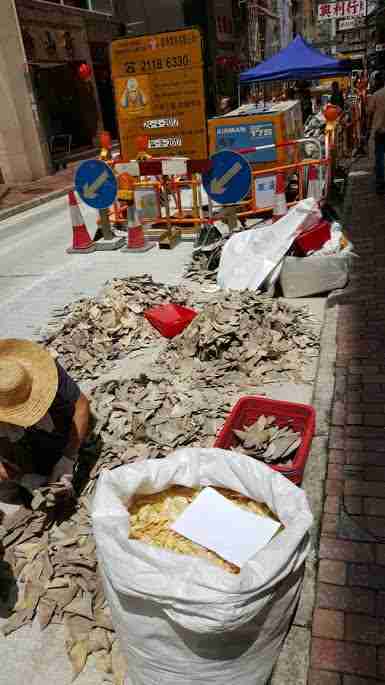 Out on the street, a man poured hundreds of shark fins out of a large white sack so the fins could dry out in the sun. The fins had come from living, breathing sharks — fishermen cut the fins right off the animals’ bodies, then tossed them back into the water. But without their fins, sharks can’t move or breathe, and they slowly and painfully suffocate to death. Why do people want shark fins? The answer is found in the murky broth of shark fin soup, a specialty dish served at weddings and banquets that can cost more than $100 USD per bowl. As upsetting as it was to see all of the shark fins, Staley, unfortunately, was very used to the sight. 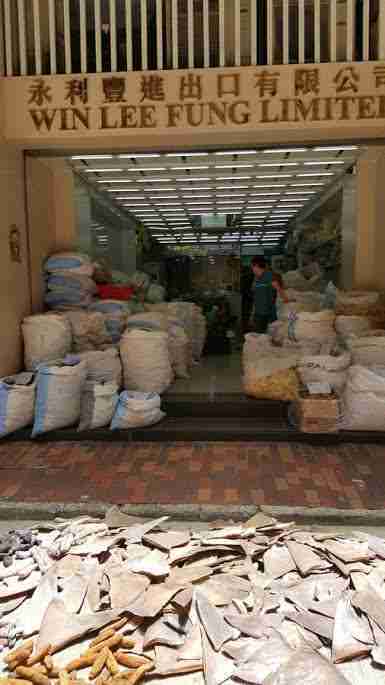 In the Sheung Wan district of Hong Kong, where Staley’s office is located, hundreds of shops sell shark fins and other dried seafood products, such as sea cucumbers, seahorses and abalone. Staley sent the images to Gary Stokes, the Southeast Asia director of Sea Shepherd Global, who’s spent years working to stop the global shark fin trade, which is responsible for the deaths of 73 million sharks every year. 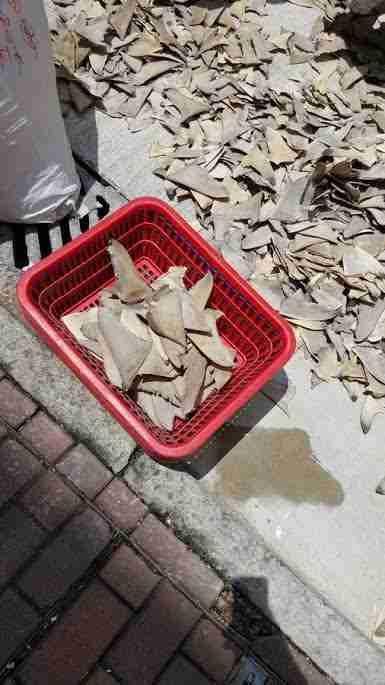 Stokes has also lived in Hong Kong for the past 26 years, so, like Staley, he’s fairly accustomed to seeing large shipments of shark fins. 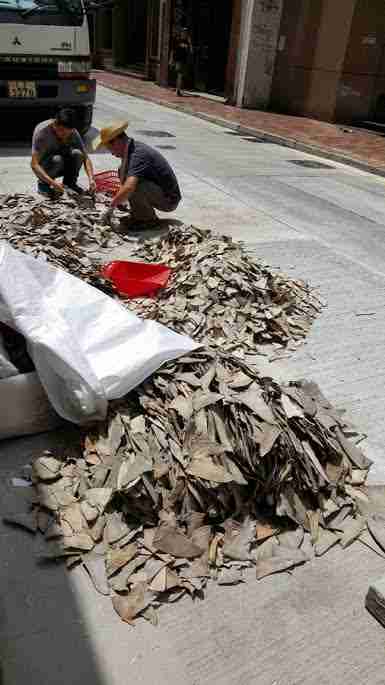 In Hong Kong, it’s legal to buy and sell shark fins, although 12 shark species are currently protected under Appendix 2 of CITES, which regulates their trade but doesn’t make it illegal to kill them. 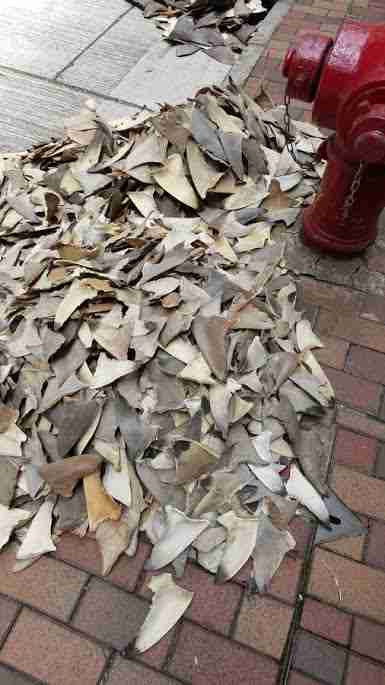 That said, Stokes explains that it’s technically illegal to dry shark fins on the street — not only does it block the road, but it’s a health hazard. 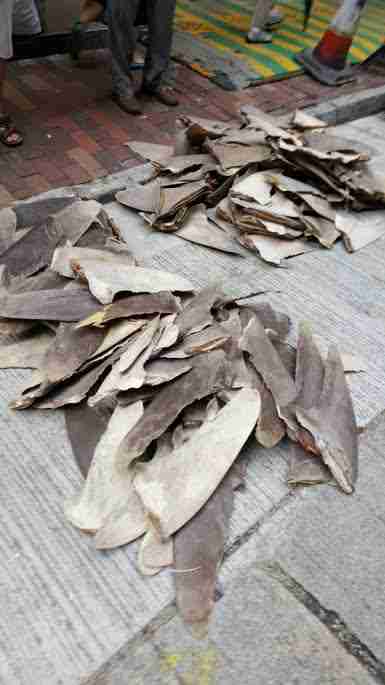 Whenever Stokes finds traders drying shark fins on the streets, he reports it to the Hong Kong police. But unfortunately, the police don’t do much. Despite the large scale of the trade — and his frustration with the police’s reluctance to persecute traders who dry fins on the street — Stokes is hopeful that things will change in Hong Kong, as well as the rest of the world. Earlier this year, Stokes and a team of investigators discovered that shipping companies like Maersk, Virgin Australia Cargo and Cathay Pacific were carrying shark fins, despite previously placing embargos on them. When Stokes approached the shipping companies about this issue, the companies started enforcing tighter regulations on imports coming into Hong Kong, and Stokes believes this has made a difference. “I haven’t seen any more Maersk containers outside of that shop,” Stokes said. Authorities are also getting better at catching people who kill sharks illegally. 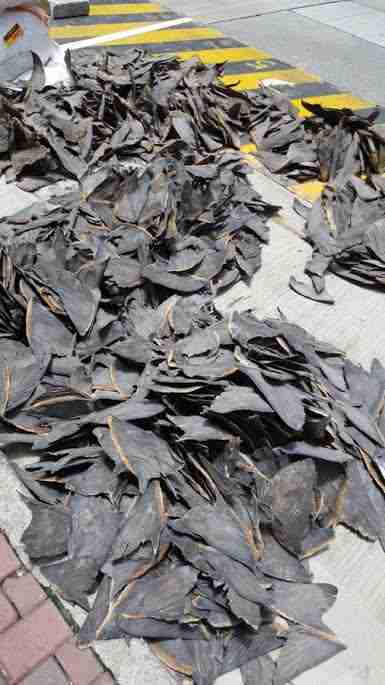 Earlier this month, Ecuadorian police caught Chinese fishermen with 6,600 sharks that they’d illegally killed in a marine reserve in the Galápagos Islands. Now the fishermen are headed to jail. Another victory is pending in the U.S. — animal advocates and policymakers are working hard to get Congress to ban the trade of shark fins in all 50 states. 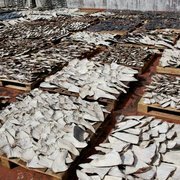 To help make the Shark FIn Trade Elimination Act a reality, which would save millions of sharks each year, you can sign this petition.